There are few horror movies as effective as Alien. It isn’t just the seemingly unstoppable monster stalking the ship, or the fact that it is set in a isolated, inescapable environment, but it also plays into some people’s darkest fears. One of those is having something lay it’s eggs inside you and then “burst” out. This fear is demonstrated on-screen perfectly, in one of cinema’s greatest scenes. There is plenty to make this scene shocking but the clues that something isn’t right are already in place by this point. John Hurt’s Kane has already been attacked by a “facehugger” but seemed to come-out alive. It’s only on a repeat viewing that you realise what the “facehugger” was actually doing. The scene also lulls the audience into a false sense of security. You know things can’t be right as the run-time of the movie is no where near complete but this a just an ordinary scene, jovial and silly, with the crew maligning the food. Even if there was a sense of foreboding, what comes next is completely unexpected for anyone watching Alien for the first time. John Hurt is the star of the scene. He sells the discomfort, then pain and agony brilliantly. The way he writhes around, making it almost impossible for anyone to get a spoon into his mouth to stop him biting his tongue or locking his jaw, is just one of subtler moments which sells the horror of the scene so well. What happens next has gone down in movie history. The first “pop” of blood is minimal but enough to leave the crew speechless and motionless. The second is the more famous moment when a baby Alien emerges from Kane’s chest. This scene was undersold to the cast, who didn’t realise how much blood would be shot out of the fake wound. This makes for one-time only, pure and realistic reactions, especially from Veronica Cartwright who actually fell back in shock and hysterics. The subtleties of the scene don’t stop there. John Hurt is dead, with his chest exposed and a monster having emerged, but the arms still moving in the background of the scene is enough to send chills. The scene also begins to drop hints about the secondary villain of the movie, with Ian Holm’s Ash stopping the crew from killing or attacking the Alien, something that will come into play later in the film. 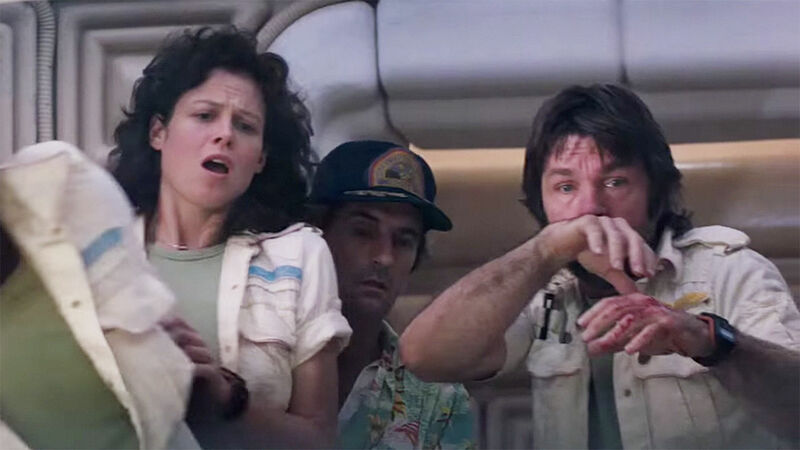 This isn’t the end to the scares in Alien but it is a moment which sticks with people long after the movie has ended. As well as a creature which bleeds acid and has a tongue which bites, it is born by gestating in other creatures and “bursting” out of their chests. 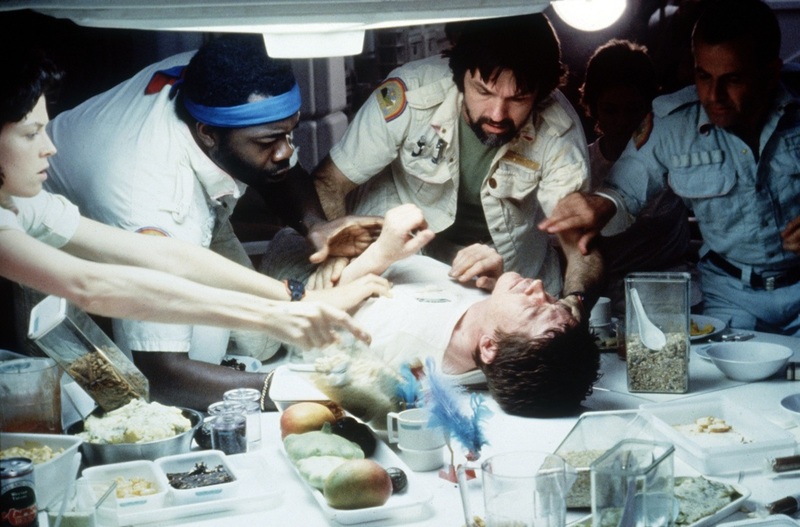 Overall, Alien is made much more horrifying by the “chestburster.” Not many films, let alone horror films, can boast a scene as effective, iconic and terrifying as this one. A scene which shows the benefits of not always telling your cast everything either. I watched Alien for the first time the night before you posted this and am still so grossed out by the little chestburster. EUGH! Ah! So jealous that you get to see it for the first time. It’s always good but you can’t repeat the first time you witness all those great, iconic moments. I love the ALIEN series, all four movies in different ways. I often rewatched “ALIENS” over and over, but the game “Alien isolation” made me appreciate the first movie even more. This game takes place a few years after the first “ALIEN” movie and uses the movie plants and schematics for the ship, making everything authentic. If you are not a gamer yet you will be after playing this masterpiece. I am a gamer. I think I need to play it. Not great with scary games, it’s almost like I’m too close to the action. Ahhhh! I am soo in love with this movie. This scene is perfect, and you described it up very well! The way he screams and the noises he makes really freaks me out. Sounds so real. It does! It is incredible. One great scene in an awesome movie overall. Great post…this scene IS so iconic. Could you imagine seeing this for the first time in 1979 in theaters? Back when movie trailers didn’t reveal everything. My dad told me when he saw this, his friend next to him threw his popcorn straight in the air in terror! Ha! You don’t get pure terror like that anymore. It all feels too artificial and signposted. I love that nothing was given away in the trailer… shame that isn’t the same today.